We have lost a number of chickens to aerial predators over the last couple of weeks—as much as one chicken per day. The red-tailed hawk pictured above seems to be one of the culprits. At this time of year, the young fledglings are leaving the nest, and the adults are teaching them to hunt. 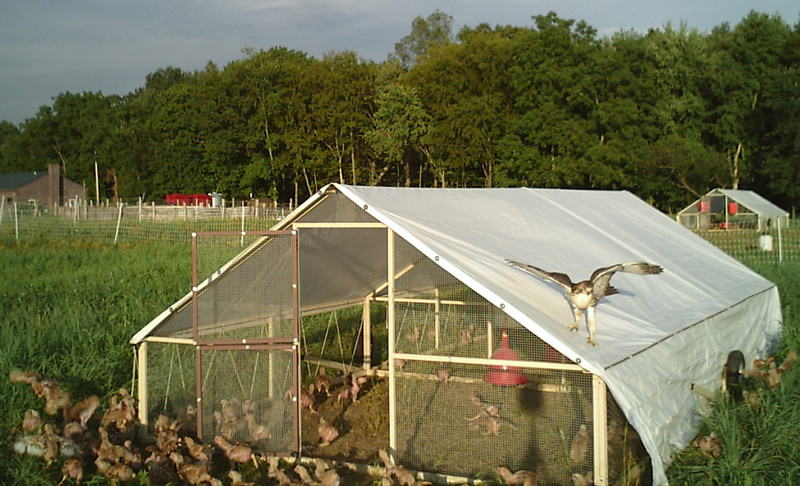 It seems that they see our fields as the perfect place to train, and to treat the whole hawk family to a good meal of organic pasture-raised chicken. This is now a major problem, and it could get worse over the next few weeks, so we decided to contact the USDA Wildlife Department to find out what options are available to us. Angelic DeButts, Wildlife Specialist with NH Wildlife Services stopped by and gave us a number of options to try and deter the hawk. These include pyrotechnics, a screech owl effigy, scary eye balloons, and trying to create a “no landing zone” in our chicken paddock. A permit to kill the hawk can be issued by the NH Wildlife services if these options are tried and none of them work. We certainly hope it doesn’t come to that. Did you find any of the non lethal options to be effective. I have had a similar problem of late and would be very interested in what may work. I only tried the fireworks and fake owl, and with little success. I never got round to trying the Mylar tape. Some one reminded me though that geese are supposed to be quite good at warding off Aerial predators. All in all we lost about 20 to 24 birds over the course of 2 two week periods about 3 weeks apart.